There are instances when we book promo fares tickets but failed to book check-in baggage allowance, only to find out later on, that you need a few kilos for your big bags and luggage. Fortunately, adding a baggage allowance is easy to do. All you have to do is go to Cebu Pacific website and then click on “Manage Booking” tab then click on “Add Baggage”. This is a guide to help you modify your confirmed Cebu Pacific booking to add check-in prepaid baggage service. Note: Paid prepaid baggage can’t be refunded once your booking is confirmed so please be very sure. 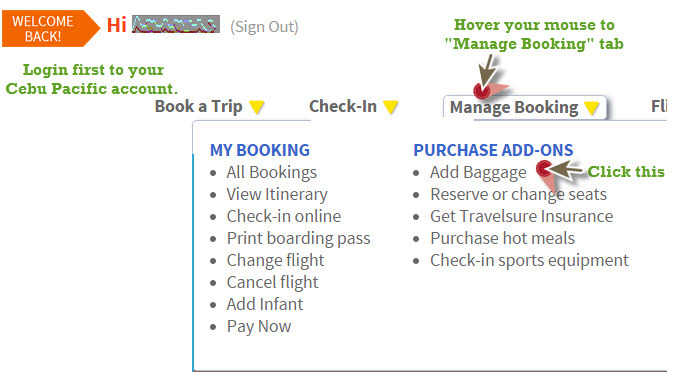 Then once logged-in, hover over the “Manage Booking” tab. Click on “Add Baggage” under the Purchase Add-Ons column. Then you need to click the confirmed booking that you want to add baggage to. If you only have one booking, the page will only show 1 option and you click the little “circle” button. If you have several confirmed bookings, all these will show. Choose the booking that you want to modify and add baggage to. Once certain that you have the correct booking, you then have to click the “Continue” button. Your current baggage status for the chosen Cebu Pacific booking will then show. If this is your first time to buy baggage for this particular booking, the summary page will show no current baggage. But if you did buy previously, say 15 kgs, and now you want 20 kgs, you will pay the difference between your original baggage allowance and your new baggage allowance. Price of 15 kilos baggage is P257.60 while price of 20 kilos baggage is P380.80. In this example, you will only pay additional of P123.20. AT THE AIRPORT CHECK-IN COUNTER, 1 kilo of check-in baggage (excess) is P200!!! So buy prepaid baggage if you need it so you can save. As of today April 11, 2017 (there has been a baggage rate increase when we first published this guide so we are updating now). These are rates for Domestic Flights. After you have chosen your preferred additional check-in baggage allowance, the page will show your new “TOTAL AMOUNT DUE”. This will correspond to the baggage package that you selected. You can now click “Continue” so you can confirm you are okay with the baggage charge and all other details. For further inquiries about prepaid baggage, please reach out to the telephone number of Cebu Pacific. Remember that Cebu Pacific Air only allows 7 kg of hand-carry bag with no charge. Any excess bags must be check-in. The fee for excess baggage per kilo once you are at the airport check-in counter is more expensive compared to if you avail of a prepaid baggage service from this airline company. It will be 200 pesos per kilo of excess baggage for Philippine flights. Short haul international flights excess baggage fee varies depending on route. Long haul international flights like to Middle East, Australia, etc are charged at the minimum of P800 per kilo of excess baggage. To find the answers to these questions: Can I bring my laptop bag? Can I bring a handbag aside from my cabin bag etc – Read this Post. You can modify your Cebu Pacific confirmed booking and add additional baggage allowance up to 4 hours before your scheduled flight. Travel wisely. Watch out for Piso Fare 2017 to 2018 Promos! Does the explanation above regarding Baggage Upgrade rates applies as well for Manila to Dubai destination? Where to pay for it if your traveling from abroad? hello, there are 3 of us leaveing manila to dumaguete,on the 26th oct.we have 3 ,20 k bags.can we get one more bag with 20k or do we need th add to one to a nouther bag. we need to know asap becouse we go to manila saterday ok thank you so much. Hi, would I be able to purchase additional baggage even one day before my flight? Thanks. i already have an existing baggage allowance of 15 kilos for domestic flight from tacloban to iloilo via cebu and i want to add additional 15 kilos but the upgrade for baggage allowance only shows upgrade my 15 kilos to 20 kilos baggage allowance which is still lacking because i want to upgrade it to 30 kilos. how is it possible??? Hi Yan, When you upgrade your baggage allowance you are actually BUYING A NEW BAGGAGE package. Mawawala yung 15 kilos mo, and you will pay for a new 30 kilos baggage allowance. There is no upgrade option 15 + 15. It’s like buying fresh baggage allowance. Hi! I’m confused, in your example above, you have existing 15kilos then you add 20kilos so have a total of 35kilos? And your response here is there is no upgrade option of 15 + 15. Does it mean, that you can upgrade your baggage but it should be higher than your previous? like 15 + 20 or 20 + 30? Thanks! I am confuse as well. Already had 15K but want to purchase another 15K via the manage booking section so that my total baggage would become 15+15=30. If the option is buying a new one, then I have to purchase the 30K and my previous 15K will be lost/ not acknowledge anymore? Hi Obert, if you have already purchased 15 kilos baggage, the 15 kilos baggage option will not show up for you (unless Cebu Pacific have updated their system and change this set-up). What we recommend you do is to call the airline’s hotline so you can talk to their CSRs. They will be able to answer any queries you may have about adding more baggage allowance or upgrading your current pre-paid baggage. The Cebu Pacific Manila hotline number is (02)702 0888. Is it okay if I’m going to process the payment today around 6pm at the nearest LBC however my flight is tomorrow at 4am. Will it appear on te system or records automatically? is it possible to add more baggage? I already purchased 40kg and now Iwant to add more 40kg, total of 80kg? Hi, max kilos for check-in baggage is 45 kilos per passenger. hi good pm po…my 30Kg baggage na po ako….kuala lumpur to manila and manila to iloilo…but gusto ko po sana bumili nang xtra pero manila to iloilo lng pwede po kaya yan na kapatid ko lng ang bibili nang xtra baggage na manila to iloilo at jan na rin bayaran? Have your sibling call Cebu Pacific po to facilitate baggage upgrade. Max baggage allowed per passenger is only 40 kilos. Cebu Pacific Hotline numbers +63-2-7020-888 and Cebu: +63-32-230-8888. Hi, I bougth an option “fly+bag” so I can take 20kg baggage. When I made a reservation I couldn’t add any baggage except that. My question is – is there any option to add 15 kg baggage more at this fare? Only one prepaid baggage per passengers is allowed. So I can’t buy any kilo else? Hi, good day po… I just want to be sure if I’m paying the right amount of Php 1,008 for (Extra large up to 40 kilos) dalawa po kasi baggage ko. hi can i purchase additional baggage at the airport? Hi.. Tomorrow 8:25am ang flight namen pabalik ng manila paano ako mag aavail ng 15kilos baggage allowance? Hi JayKaye, I suggest you CALL CEBU PACIFIC Hotline asap at (632) 7020-888. Sa website of the airlines pwede kayo mag add on ng check in baggage po. Hi there! I have some queries. I had my booking “fly+bag” but then I want to add some additional like 15 kilos, but unfortunately there’s no option for that. So, is it possible? how can I avail for it? Hi gudafternoon,nagbook po kami ticket but suddenly the baggage is not included,how much if we will add 20kg baggage from hongkong to manila? Try to go to the Cebu Pacific Website and go to the Manage my Booking Tab. There you can add or your Check in Baggage service and you can see the charges there. Thanks for reading Piso Fare Philippines. Hi I tried to upgrade my pre paid checked in luggage from 20 kgs to 40 kgs. Flight from manila to kalibo on july but it seems the system just allow 20 kgs only. Can you help me what to do? There is a chance that you plane can carry a certain total weight, thus they are not allowing passengers to bring in bulky luggage. Hi I’m flying on Sunday July 3 connecting flight from KL to Manila then Manila to tuguegarao.My boss has just book me 20 kg and I want to add additional 20kg ,is it possible for me to do it online?and how?hope to here from you soon!thanks and have a good day! hi! can.I use box instead of luggage for my check in baggage? So I can check two bags as long as they don’t weigh more the 45 kilos combined? Hi, i already purchase 40kg, in regular booking, and im hoping to purchase another 20kg, how much weight is the limit per person? If, book a flight fly+bag 20kg+ food, then we upgrade the baggage for 40kg, is it possible to add on more baggage, using the prepaid baggage? There are limits per passenger… if you are travelling in a group it is best to distribute the baggage allowance to all of your group members. if i am not the one who book the ticket can i add baggage using my own account in cebu pacific? When you upgrade, you do not buy a totally new luggage allowance which is added to your already booked allowance, so: if you had 15 kg and you chose 20 kg, you do NOT get 15 kg + 20 kg = 35 kg but effectively just 20 kg. – In my case I had 20 kg that I payed PHP 358.40 at the time of the booking. – I then chose 40 kg and it was indicated “add PHP 761.60” which is simply the difference between PHP 1’120 for 40 kg and PHP 358.40 for 20 kg. – At the end I got my new confirmation which effectively shows 40 kg baggage allowance and NOT 20 kg + 40 kg = 60 kg. CONCLUSION: You just pay the difference between the former and the new baggage allowances and get what you have chosen in kg. This should be corrected in your guideline. Hi Jack, thanks for visiting our website!!! what if I wanted to change or cancel selected baggage allowance, is it possible? No, you can upgrade to 40 Kgs, but you will forfeit your previous 20 kg allowance…. Max of 40 kilos per passenger. If you want more allowance, bibili ka po ng upgrade pero ma forfeit na yung una mo na avail. hi paano po ang ginawa nyo in this case?? i also have 40kg and ngexcess ako ng 6kg?? Itawag nyo po sa Hot Line number ng Cebu Pacific para i upgrade ang baggage.. Pwede din punta kayo sa website ng Cebu Pacific, then click Manage my booking and from there bili kayo additional baggage allowance po. Di po ako nagavail ng prepaid baggage nung nagpabook ako. Pwede po bang magavail ako 2 weeks before ako umuwi? Magkano po ang babayaran k sa 20kg? From singapore to pilipinas po. yes pwede po…. to know how much, punta po kayo sa website ng airline na sasakyan nyo at iba iba po ang rates. Hi I booked flight and chooses fly+bag which is included 20kg but then I also picked add on with 20kg am I allowed a total 40kg for check in baggage? Hi.. ask ko lng po qng san makikita yung reference # pra po mkpagbayad s bayad center for prepaid baggage.. yun bang reference # eh un ung transaction id? Mtagal n kasi ko nkabook kaso walang baggage then eventually my mga gmit ako n kailangan dalin.. hinahanap q yung reference # pra mkapagbayad s prepaid baggage thru bayad center.. d ko nmn makita.. wala din email n dumadating skin..
Hi, I booked a flight and paid for it already. Now, I thought I might need an additional baggage allowance so I went to “Manage Booking>Add Baggage” now I have a payment Due of P224 for choosing 15 kilos baggage allowance, I haven’t paid for my additional baggage allowance yet and now I no longer have any intention of doing so since I think I don’t need it anymore, my question, If I don’t pay for it will they cancel it or will they still let me pay for that P224 (15 kilos) baggage allowance fee? Hi, My Husband booked a flight for me departing from cebu at 5:10am to butuan. He purchased flight+bag allowance which is included 20kg. Now i wanted to upgrade my baggage allowance to 40kg but it wont give me a choices. What i need to do now? I really need to upgrade my baggage allowance as im coming from USA. Some flights doesn’t allow more than 20 kg due to plane capacity… best if you can contact the airline company. I just booked 4 roundtrip tickets for Bacolod – Cebu -Bacolod; I did not choose prepaid baggage since we don’t need it but after paying it and getting the confirmation number, that’s when I noticed that I was charged 4 prepaid baggages from Cebu to Bacolod. Immediately, I called their US hotline number for them to correct the charges but the staff said it could not be cancelled anymore. This was less than 2 minutes of me booking it and I did not even purchase that baggage allowance. Any advice who I can contact to have this issue corrected? I was charged about P1,500 for something that I do not need and did not even purchase. Thank you so much for your help. It is best to send an email to the customer service of the airline po. Hi po paano mag bayad sa alipay for additional baggage? d ko po kasi alam gusto ko sana sa cebuana nlng kaya lang hindi kasi lumalabas yung option for cebuana..
Hello. Nakapag booked na kami ng flight to Iloilo this May. Pero wala pa atang kami nababayaran for baggage.. Bayad na ung ticket…pwede ba sa airport nlng mag babayad about baggage ? Hi is bayad centers still available for payment if adding baggage, i logged in and try but it seems it is not available anymore. pls confirm. Hey guys i have a small confusion. I bought a ticket but it just includes 20 kg and i want to turn it into 30 kg how do i solve this problem. Go to cebupacific website, then click on “Manage Booking”, then click “Add Baggage”. It will require you to login to cebu pacific. You can then choose 30kilos, you will pay the PRICE DIFFERENCE between 20 kilos and 30 kilos baggage. If you do not have an account with Cebu Pacific, call up their hotline and request a customer service rep to add the 10 kilos more to your baggage. Again, you will only pay the price difference of your prepaid baggage upgrade. what if I already had the upgrade of baggage allowance like 3oKg na.. allowed ba na 2 bags yan na ang total ay 30kg? Ano po ba dapat kong gawin.. magbook po ako ng ticket yung FLY+BAG which is 20kls lang allowed. Pero yung bagahe ko po isa nasa 35-40kls.. paano po ba mag add? Pwede po ba yung ibook ay FLY lang muna then bago ka magpurchase ng baggage? Kindly advice po. Salamat. Hi! So, ok lang po ba na ganito ang gawin ko. Magbook po ako ticket (FLY ONLY na 7kgs allowed lang) and then 4 hours prior to our flight, I can upgrade the prepaid baggage allowance na 20kgs? Please advise po. Thank you! Gusto ko sana mag add on upto 45 kgs kasi 45 kgs yung baggage allowed sa international flight ko from Doha next month. However, max 40 kgs lang ang mai-add on sa CebuPac online. Please advise. Good pm po. May ticket na po ako Manila to Puerto Princesa. Meron pong 20 kilos baggage allowance. Paano po kapag gusto kong gawing 40 kilos? At magkano naman po ang babayaran ko? Thanks po.